Our typical modus operandi when evaluating vehicles like these is to locate the thinnest squiggly line on a map we can find to see how the truck fares on lumpy backroad tracks. This pickup demanded a fresh approach. A Ram is a trusted tool for many owners, albeit a very nice one servicing many different duties. Most use their truck as a daily driver, workday hauler, and when opportunity presents itself, a weekend toy. To that end, AEV’s interpretation of this iconic pickup retains those attributes, and as they’re prone to do, they simply made it better. 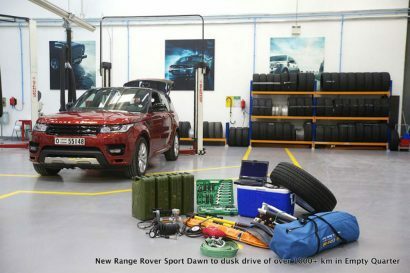 They also enhanced its utility as an overland platform, one with already impressive off-road aptitude and tremendous towing and payload capacity. 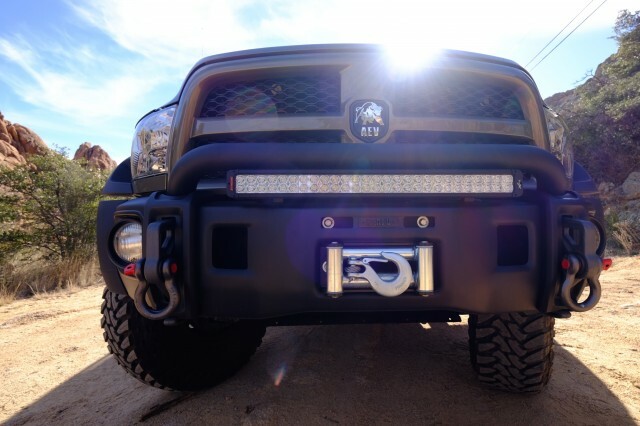 The foundation of this particular truck is a Ram 2500 Crew Cab 4×4 powered by a Cummins 6.7-liter I6 turbo-diesel engine. 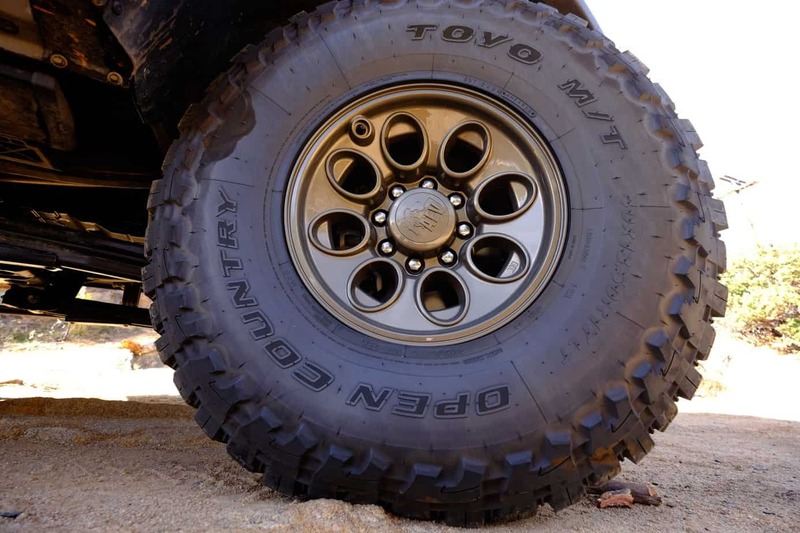 Power is put to the 17-inch AEV Katla wheels, wrapped in 40-inch Toyo Open Country MT tires, via a 6-speed automatic transmission. 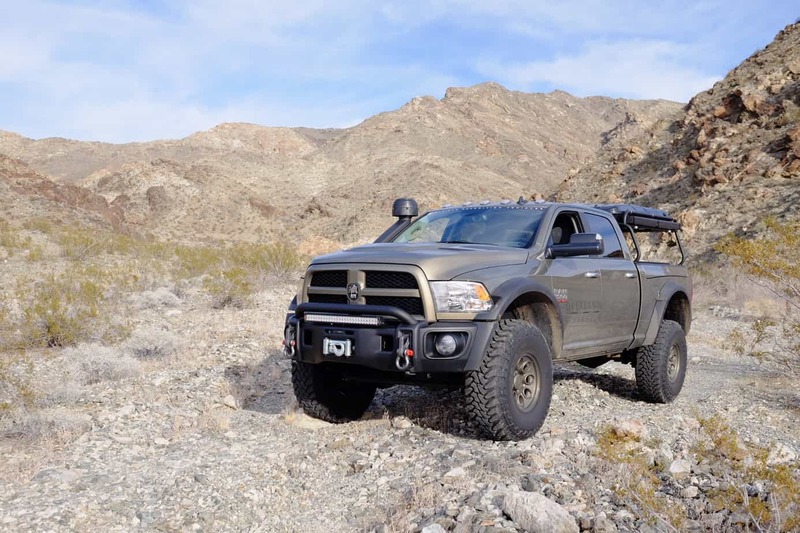 To accommodate that big rubber, the Prospector rides on an AEV’s new Ram HD Dual Sport SC suspension with a 3-inch lift. Enshrouding those huge tires are oversized fender flares, completing a package that is enormous, but with balanced proportions. 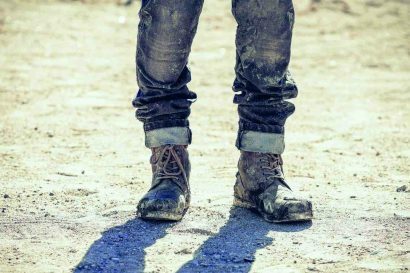 Impressive as the stance is, there are other elements to this Prospector that set it apart. 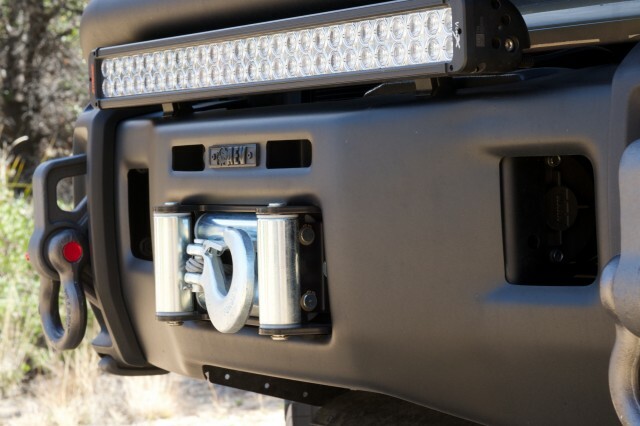 The AEV modular bumper blends seamlessly with the truck’s lines whereas many aftermarket units stick out like a squared jaw with a severe underbite. Their bumper is made of 4mm-thick stamped steel and is shaped with soft lines that complement the Ram’s fascia and provides a clean perch for the 16,500-pound internally mounted winch, auxiliary driving lights, and LED light bar. 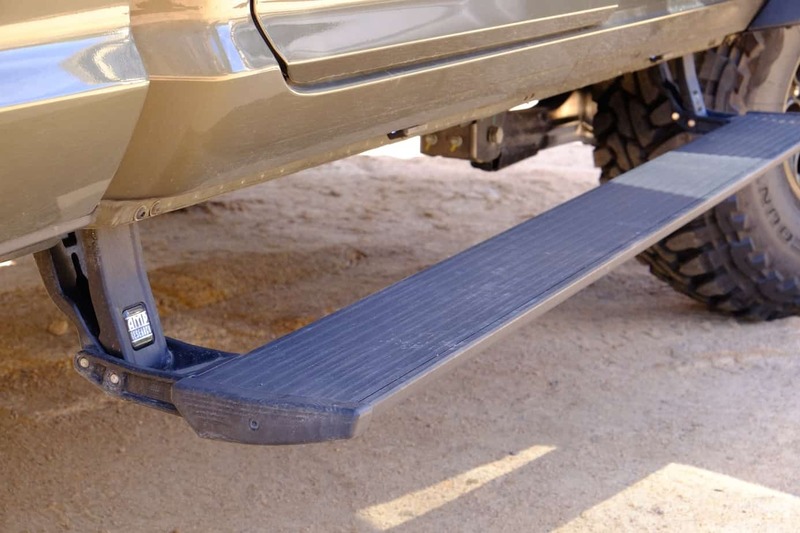 The most impressive feature of the AEV bumper are its two ductile iron tow loops, each rated to OE load specifications and designed with enough brawn to serve as wear plates when sliding over steep obstacles. Given its height, positioned just at about eye level, it is almost easy to miss one of the more refined design elements of this truck––the hood. 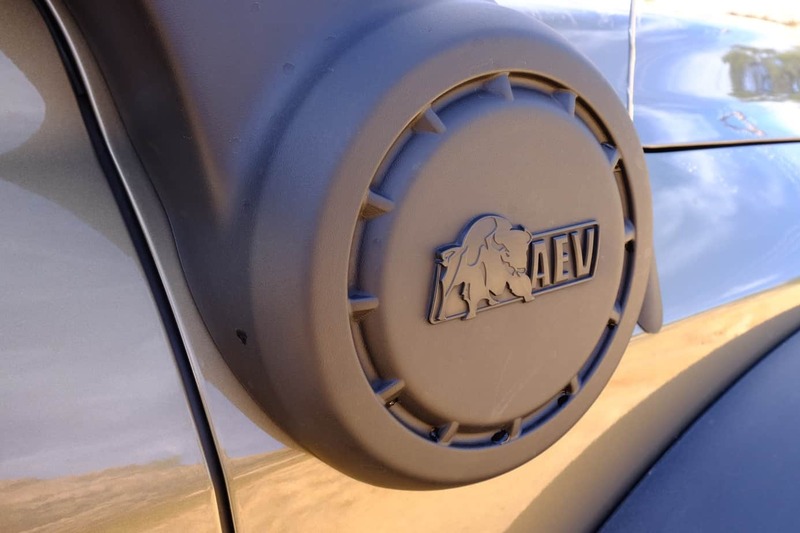 Reminiscent of the Heat Reduction hood used on their Wrangler builds, the hood on the Prospector is elegantly sculpted and further accentuates the unique lines that AEV is known for. The proprietary raised intake with its giant pre-filter ensures only the cleanest and coolest air reaches the engine. The peak of that intake is a solid eight feet off the ground. 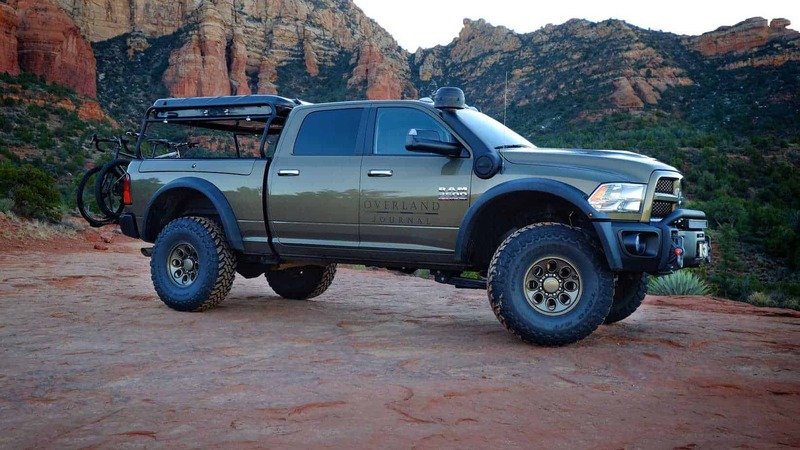 With front and rear lockers, an onboard air compressor, Ram’s own storage boxes built into the sides of the bed, and a finely appointed interior with all the luxuries any overlander could ask for, the Prospector is a formidable traveler. That bed is capped with AEV’s own tonneau cover and tubular cargo rack fitted with a James Baroud hard-shelled roof top tent. Any suspension manufacture has a tough job, the product rarely seen, but the result felt with every passing mile. 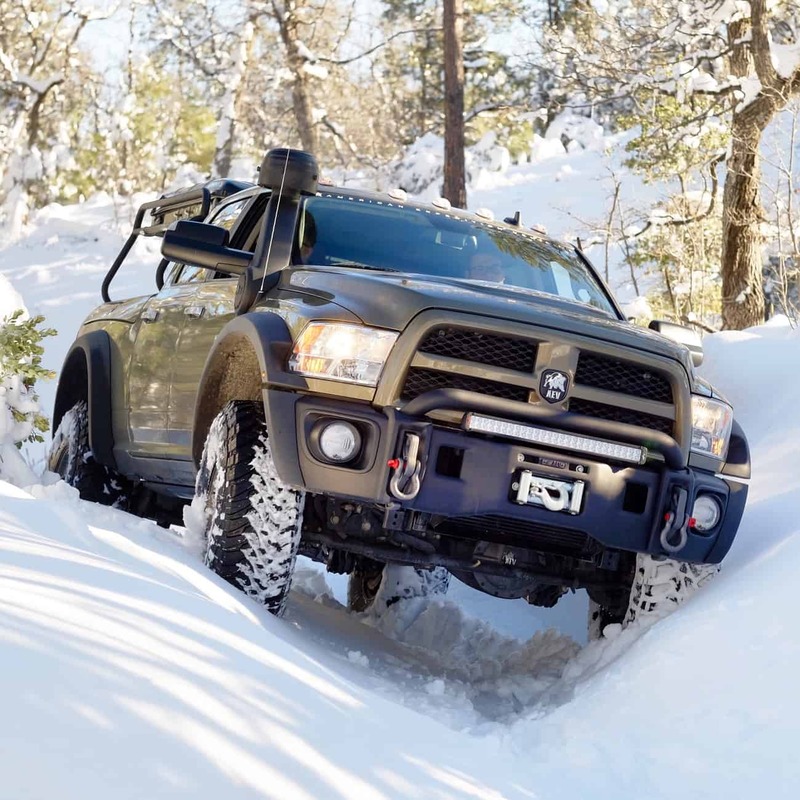 With regards to the AEV DualSport suspension, it is another impressive result by the team in Montana, achieving the seemingly impossible blend of durability, reliability, serviceability, ride quality, limit handling performance, and technical terrain articulation. The AEV engineers have always made suspension a priority and the difference is noticeable from the first rock or round-a-bout. Fortunately for me, I had recently driven another Ram with an expensive racing ‘inspired’ suspension to compare. Without question, the AEV system performed better overall and retained factory payload. The ‘other’ suspension did a good job with high speed hits off-road, but everything else suffered. So, what makes the AEV suspension work well everywhere? 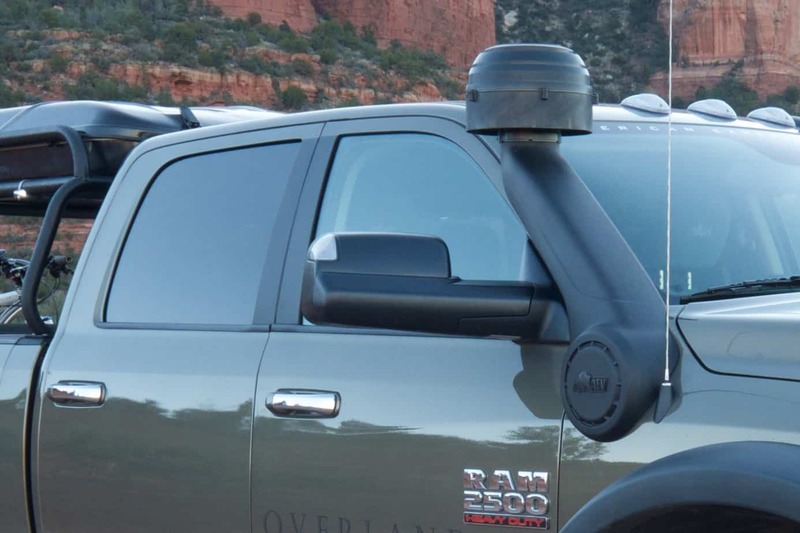 I am not saying it works perfect everywhere, as the goal is clearly an intentional compromise to the function of a pickup, but the kit does inspire driver confidence, reduce highway fatigue and still allow full payload. 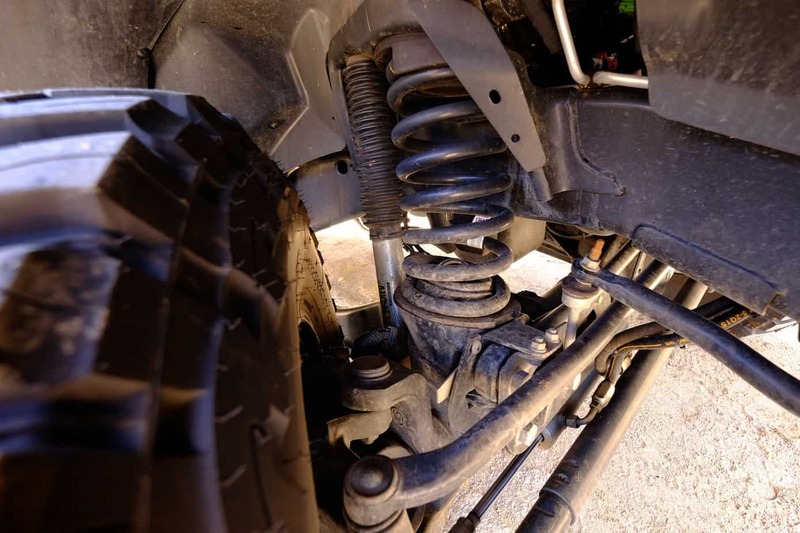 One of the critical considerations is the overall correction and enhancement of the suspension geometry. The suspension works particularly well at speed and in limit handling scenarios, the geometry adjusted to correct for caster and roll center. Even with 40-inch tires, the hood remains impressively flat under hard lane changes or aggressive curves. The coil sprung rear is a huge improvement regardless, moving chatter and axle wrap to imperceptible levels. The rear roll center change is particularly effective. Even with a three inch lift and 37” tires, the suspension passed FMVSS standards. Another critical correction was to the steering, AEV providing a new drag link and track bar, while also relocating the track bar tower. All of this improves steering precision and directness while also reducing bump steer. Of final note is the shocks, produced by Bilstein with digressive valving. This serves a few important functions, the most important that driver feeling of directness and stability on the highway. The shocks are firm under smaller inputs, yet become softer as the impacts become more pronounced. 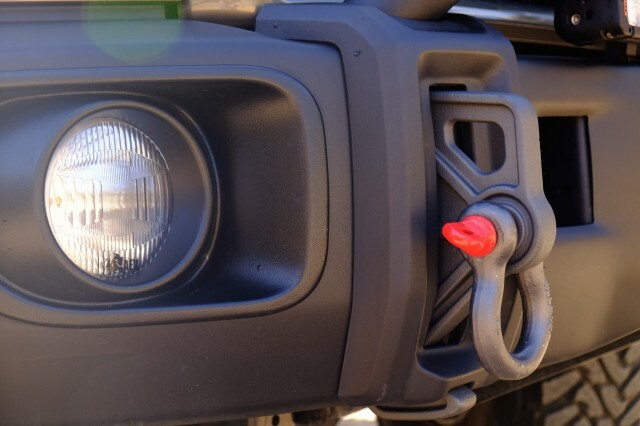 This allows the suspension to react to larger inputs with full suspension travel, greatly attenuating harsh impacts. 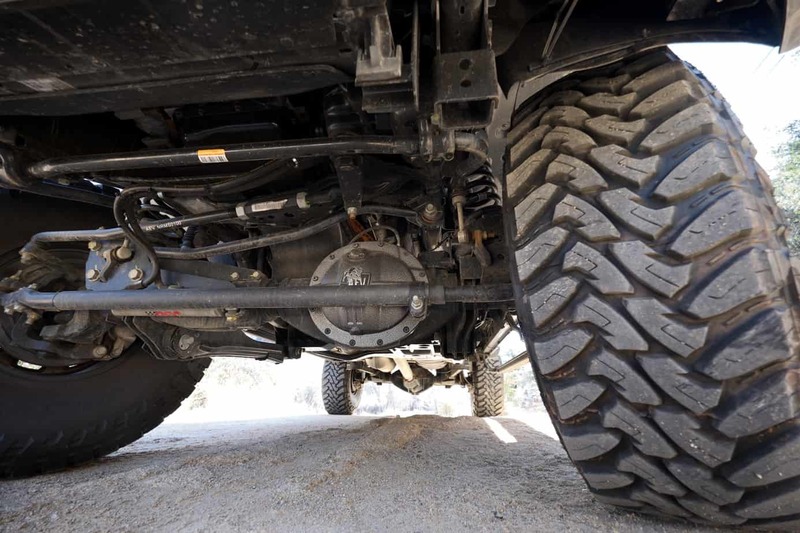 This all works because of the larger tires, the huge section height rounding the smaller highway and trail inputs (while the shocks remain firm for stability) and the massive diameter helping to leverage through the big hits. 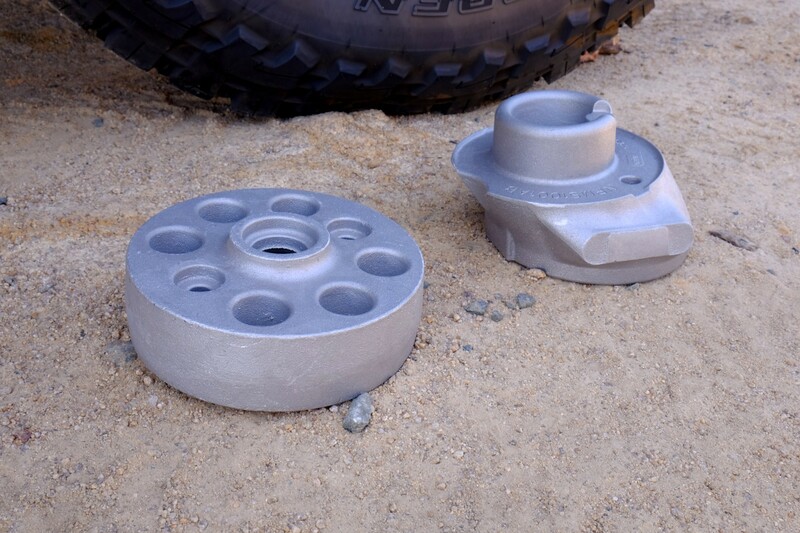 Digressive valving is a perfect fit for big tires! 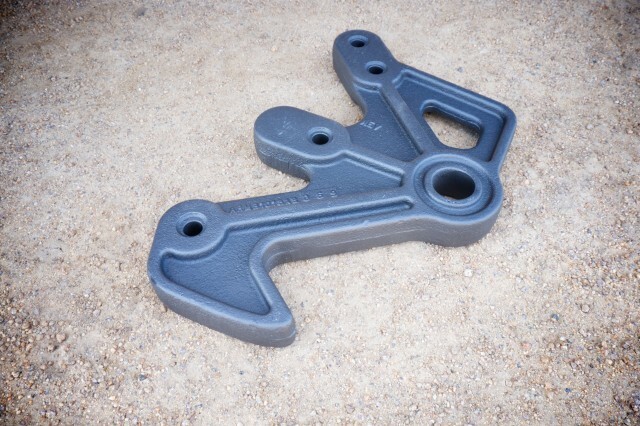 The spring relocation brackets are stout pieces of steel designed to endure years of use. One of the key components of the system working is the retention of the factory springs. Sure, anyone’s first reaction is – spacer lift, but these are not just spacers. The engineers at AEV prefer to call them spring relocation brackets as they do far more than just add height to the spring mounts. Stand by for a moment and let me explain the engineering reasoning behind this. After talking with the design team at AEV, they made it clear that if the suspension could have been made better with springs, they would have done it. 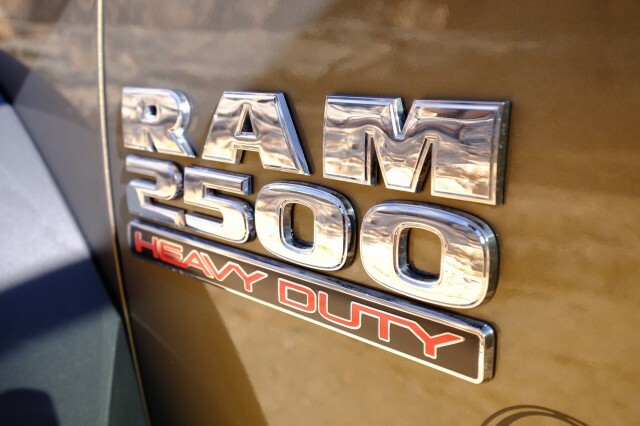 However, a Ram has over 40 different spring combinations to adjust for cab type, drivetrain, wheelbase, payload, etc. To offer even a dozen different spring options would still be a compromise. Only the factory has full access to frequency tuning and FEA data, which means that only the factory springs are perfectly suited to the Ram the customer purchased. 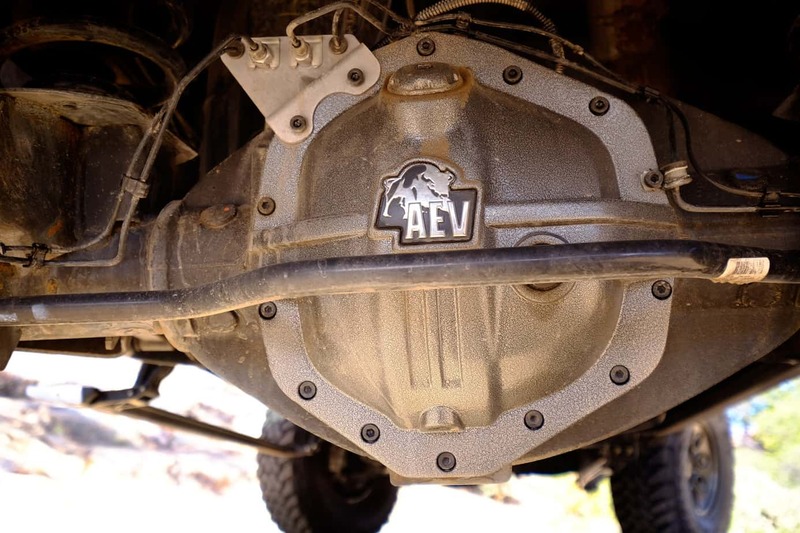 As a result, AEV invested in high-quality, made in America cast brackets that adjust for spring position, lift, spring angle, and spring retention. Both the front and rear spring relocation brackets are impressive hunks of steel and do the job better than any ‘one spring fits all’ lift kit. This is a true suspension system that gives increased articulation, better on road handling and less driver fatigue. It is also important to mention the new steering kit with a forged draglink that raises the steering back to stock. This system eliminates the need for solutions to remedy negative steering attributes caused by the need for double stabilizers, frame reinforcing kits for the steering box, or special joints. The system also includes a new track bar which was required to move the suspension forward. 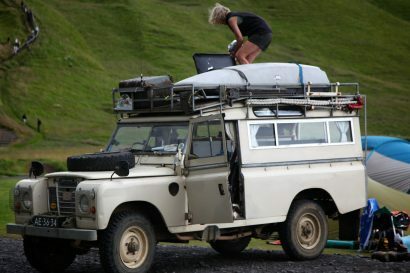 No matter how formidable any overland rig is off highway, pavement is inevitable. Whether getting across town or to a backcountry destination, tarmac is more common than we would like. 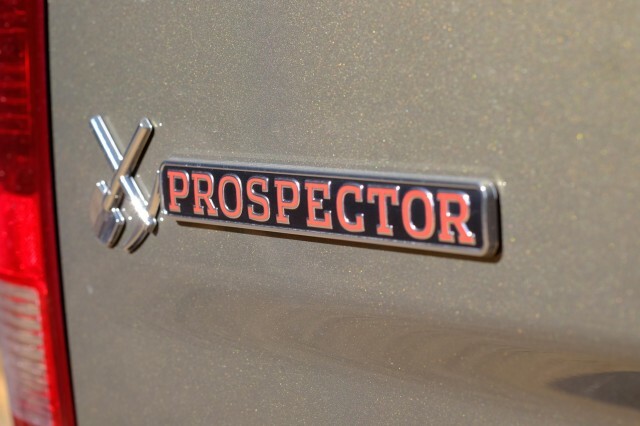 Fortunately, the Prospector is a sublime road machine. On Interstate slab, the big Cummins charges hard making light work of inclines and on-ramps. It accelerates to speed and can knock down endless miles with the cruise control set at the upper reaches of the legal limits with no perceptible effort from the engine. On winding mountain roads, although it is a big ship to pilot, it navigates tight turns and switchbacks without excessive body roll. It’s smooth, easy to drive, and extremely comfortable. 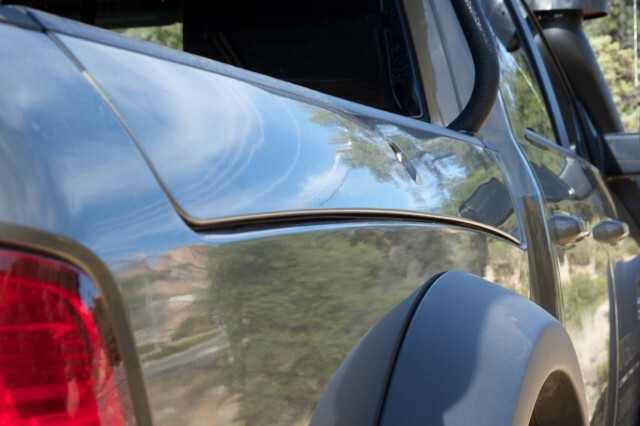 Because it sits so high, and due to the limited visibility of such a tall hood, parking in tight quarters can be unnerving, but with a little time behind the wheel, does get easier. It goes without saying that front and rear lockers, 40-inch tires, and a 16,500-pound winch will likely get you where you need to go. Despite its long wheelbase, somewhat limited visibility, and generous size, it is surprisingly easy to drive in technical terrain and seems wholly unfazed by obstacles that challenge lesser vehicles. 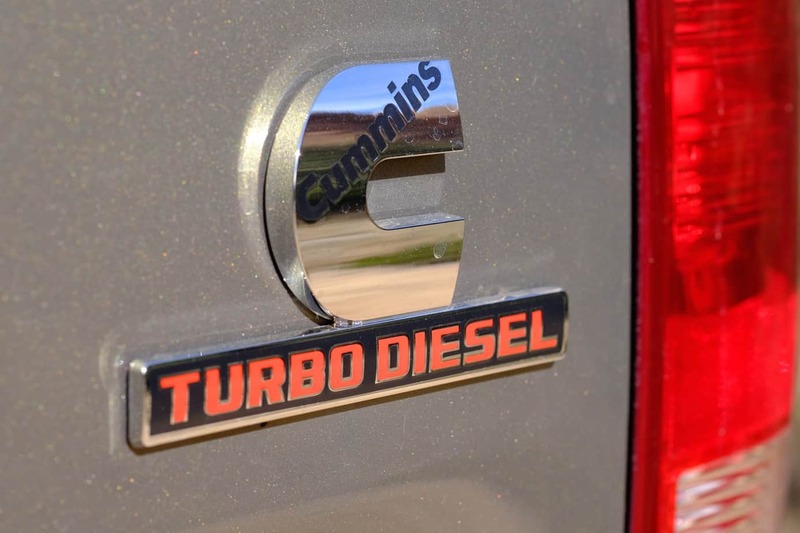 Like most pickups, the rear wheels are not as weighted as the front, and the diesel does require a slight spool-up to access usable torque, but overall, few things present much impediment to its forward progress. 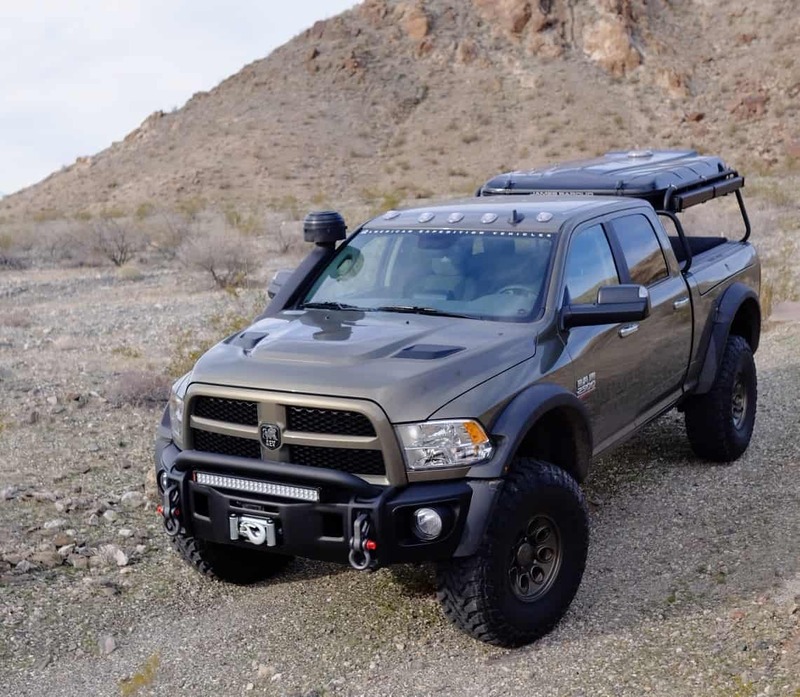 Like everything AEV builds, the Prospector is refined, perfectly executed, and represents the best possible version of a Ram truck. 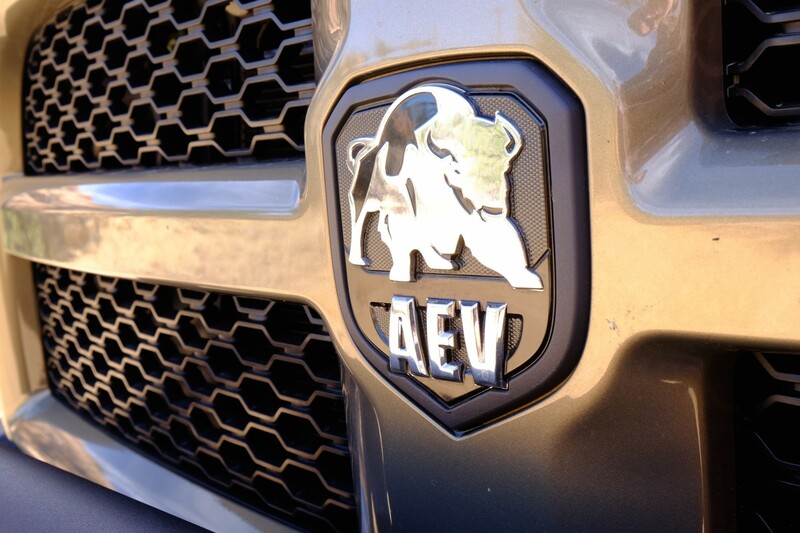 The AEV components mesh with the OEM product perfectly. It is not only a striking truck to behold, it performs flawlessly. For those overlanders wanting a platform they can use to tow or portage heavy loads, while not sacrificing off-road performance, it has no apparent rival. 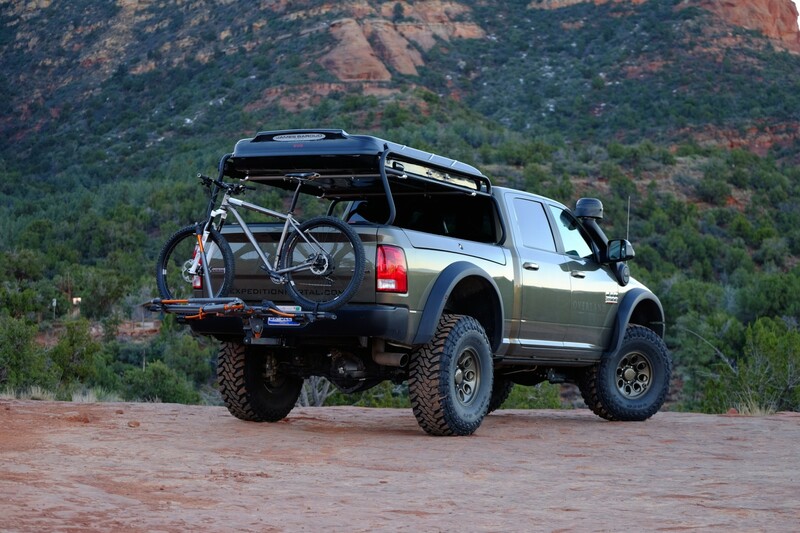 Fitted with a slide-in camper the Prospector would be a capable traveler undaunted by the ugliest terrain. With prices for similar Prospectors clocking in between $78,000 ad $90,000, these are pinnacle vehicles but for those with the desire and means, are worth every penny. The drop-down side steps making climbing into the interior easy. Without them, it would be a tall order, literally. Ram’s side storage boxes make good use of otherwise dead space. The boxes, and the tailgate, unlock with the key fob.